Yes it can be in fixed deposit account, but make sure it is one here you can withdraw with loss of interest. I always do this. It saves getting mixed up with daily money. Yes it can be in fixed deposit account, but make sure it is one here you can withdraw with loss of interest. I always do this. Exactly. Just to add "loss of interest" ONLY....no other bank charges. Like cruncher..exactly what I will do in future. I have used the "fixed deposit " for about nine years, but the new(ish) io's (for about four years now want bank statements too. I highly recommend that you open an account at a bank near your Immigration office, to avoid this sort of problem on renewal day. And, neverleave your renewal until the last day. Same here in Khon Kaen. "Fixed Deposit" account at Bangkok Bank. I've been using Fixed Term deposits for years (7+) with NO problems of any kind. Immigration at Jomtien has never had a problem as long as the bank book is updated (within a day - or if it's updated on Friday and you are in first thing Monday morning) and you have the bank letter. 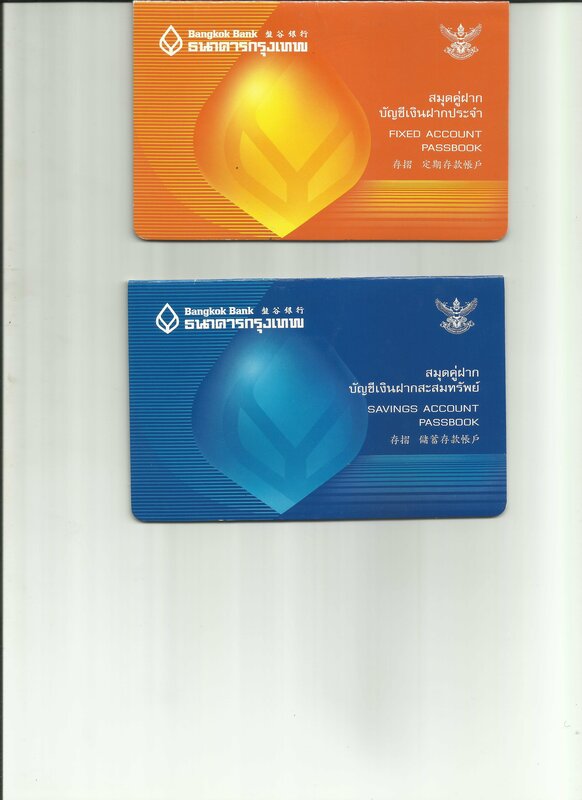 The regular 1 year Fixed Term account at Bangkok Bank pays 1.5% per annum. On 800k that works out to 12,000 in interest minus 2,000 in taxes, leaving 10,000 net. More than enough to pay for your annual Extension as well as a Multi Re-entry permit (if required). The account auto-renews (at the same rate) every year and the interest can be deposited in your savings (or whatever) account or rolled over in the Fixed Term account. KrungSri I think has a 4 year fixed term that pays better (2.15% I think it was for a 48 month term) which would be a better option as it would give you about 5,000 baht more interest every year. The problem with those promotional accounts is making sure that if you are renewing them when the term(s) are due, that you make sure any new deposit will be in the account long enough to meet the 3 month "seasoning" rule. Plus it's a pain in the @** to have to keep opening a new "promotional" Fixed Term account, transfer the money from the old one, then close the old account - every time a term comes due as they can't simply use the same account and renew the deposit for a new term for some reason. Also - keep in mind that almost every Immigration Office has different rules so you need to confirm with the office you deal with as to what is acceptable to them. As mentioned in one of the other IMM threads vis-a-vis the new regulations, I previously used a bank deposit for my THB800k application at Chaengwattana, but it was problematical, as the IO did not seem familiar with a "fixed deposit", but only with a passbook savings account. Things may have changed at CW in recent years, so I would be interested in knowing from anyone with that experience, whether Fixed Deposits are an acceptable method. You might have a problem opening a fixed account. I have had a savings account at SCB for 14 years. Also a number of fixed accounts over the years. When I went last week to open another fixed account they refused unless I returned with my Wife who had to provide her ID card and tabien baan. Looking on their website it says that you need a Work Permit to open one. Sorry, but a bit confused here. How does your fixed deposit get processed through a "bank book"? You get a letter from the bank stating the amount t a d how long you've had it. ID card (A foreigner using a passport and work permit,"). That's noted at the bottom of all the different account types it seems except for the EZ Savings "ePassbook" account. However, other banks have different rules, and even other branches of the same bank can have different rules.